Walter Dahn, The Momento m., 1982, oil on canvas, 78 3/4 x 45 1/4". Walter Dahn is a founding member of Mülheimer Freiheit, aka the Junge Wilde, a group of young German artists who took their moniker from the Cologne street on which they once worked. 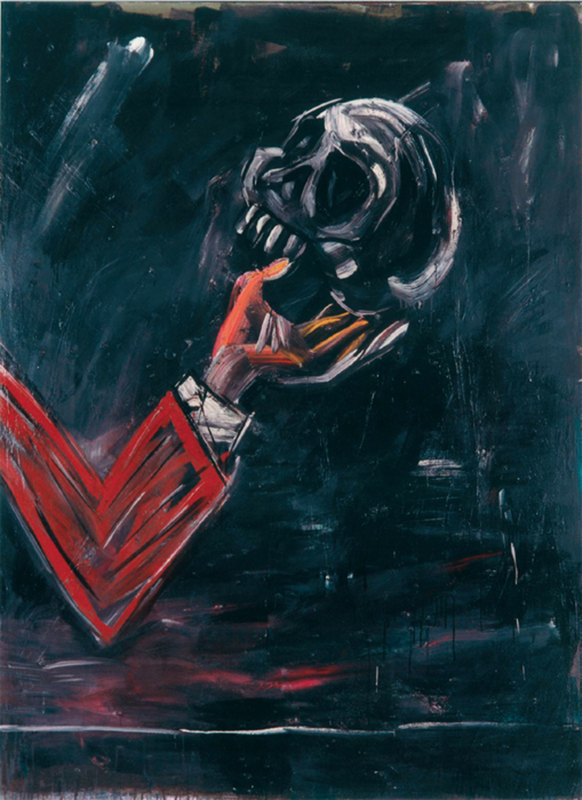 The artists in question were part of a generation of talented painters whose work was seriously informed by the “capitalist realism” of Sigmar Polke and by the shamanism of Joseph Beuys. “We were . . . like a band. We went to every concert we could see. . . . It was a kind of mixture of an insane asylum, kindergarten, and art school,” says Dahn in an interview with Richard Prince that appears in the exhibition’s catalogue. Prince, who both curated and loaned to this retrospective of thirty-plus works dating from 1981 through 2007, clearly regards Dahn as a bloody genius.